Clinically proven by over 50 studies to actively lower cholesterol. The lighter way to lower cholesterol. Blended with Rapeseed, Sunflower & Linseed oils containing Omegas 3&6. No artificial colours or flavours. Suitable for vegetarians. Not suitable for frying, baking and freezing. Flora ProActiv Light spread is perfect for families who prefer a lighter spread alternative to butter (87% less saturated fat than butter) but still fancy a scrumptious mouthful! Flora ProActiv Light spread is great for everyday sandwiches and snacking, with less saturated fat than butter (87% less saturated fat than butter) and 30% fat overall. Margarines contain 80% fat, whereas our Flora ProActiv Light spread contains less than 80% fat and are therefore classified as vegetable fat spreads. 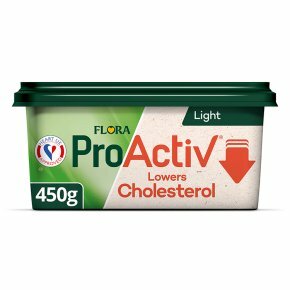 Flora ProActiv Light cholesterol lowering spread is made with a blend of tasty plant goodness (Flora Light spread is 87% lower in saturated fat than butter) - 30% plant oils including sunflower seed, linseed and rapeseed which are naturally high in omega-3 and 6. Flora ProActiv Light spread is a yummy lower fat alternative to butter - it's perfect spread on toast, or melted over vegetables and baked potatoes. Reducing consumption of saturated fat contributes to the maintenance of normal blood cholesterol levels. Flora Light spread is made with plant oils from sunflower seed, linseed and rapeseed which are naturally high in Omega 3 and 6 and help contribute to a healthy lifestyle and helps to lower cholesterol. Other Flora ProActiv spreads to try include our Olive and Buttery spread range to help reduce cholesterol. Flora ProActiv Light is a low fat spread which helps to lower your cholesterol. Suitable for freezing. Not suitable for cooking, baking and freezing. High cholesterol is a major risk factor in the development of coronary heart disease. As heart disease has multiple risk factors, you may need to improve more than one to reduce your overall risk. Check with your doctor first if you are already taking cholesterol lowering medication, or if you have special dietary needs. Not suitable for pregnant or breast-feeding women and children under 5. This product is not intended for people who do not need to control their blood cholesterol level.